Let’s take a look at the pattern Verb + 힘들 것 같다. 힘들다 means to be hard or difficult which may refer to one’s feeling or action. 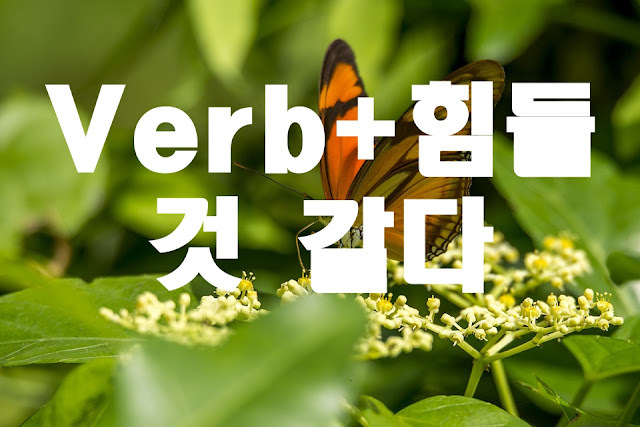 In here, it is combined with the verb-ending 것 같다 in future form. Literally, it means it seems difficult or I think it is difficult. When preceded by a verb in 기 form as in가기, 오기, 먹기, it expresses the speaker’s light refusal of a favour or a suggestion- you feel sorry for not being able to do something because of your circumstance. In English, we say something like I don’t think I can do it. 지금은 혼자가 아니라서 점심 같이 하기 조금 힘들 것 같은데. I don’t think I can have lunch with you because I am with someone else. 오늘 만나기 힘들 것 같아. I don’t think I can meet you today. 비가 많이 와서 가기가 힘들 것 같아요. I don’t think I can go because of the heavy rain. 차 빌려주기 힘들 것 같아요. I don’t think I can lend you the car. 걔랑 같이 살기 힘들 것 같아요. I don’t think I can live with him.